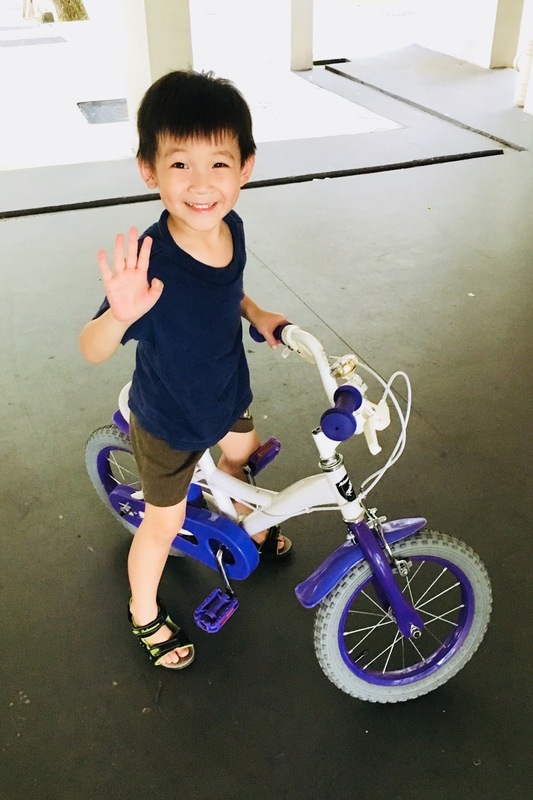 My Story, His Grace: Joram Learnt To Ride A Bike! Joram Learnt To Ride A Bike! 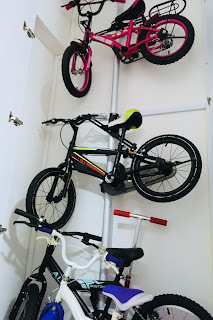 My elder girl had been complaining that she preferred to ride her big brother's bicycle because hers was getting too small but my eldest boy was unwilling to let her use it for more than a few minutes since he also wanted to keep riding. I got very fed up with all the squabbling every cycling session so I thought it was high time to do a systematic upgrade. We bought the biggest child bike we could find for my no. 1 kid. To convert his old one into something more girlish, I used red acrylic paint to go over the green decals on the bicycle. Instead of green and yellow, the brother's bike became red and yellow for his younger sister to use. I also unscrewed and threw away the dented basket at the handle bar of the pink bike my no. 2 used to ride and lowered its seat because it was a tad too heavy and tall for my younger girl to inherit. 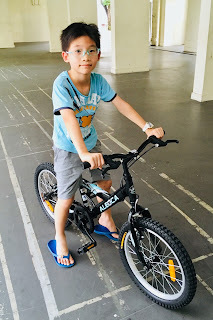 Thankfully, Joram was rather happy with the purple bike which I bought less than a year ago for his second sister. After I tore away the stickers which said "bella", it looked pretty decent for a little boy to use. At first, I kinda expected Joram to take quite a few sessions to get used to the heavier vehicle he just took over before he'd be ready to transit from "striding" it to actual pedalling. The good old strider was nearly half the bicycle's weight after all. To my great surprise and delight, he started cycling half an hour later after I gave him a few pointers. Wow! This makes him the earliest to learn how to ride a bike among all of my kids at 4 years and 11 months old. I'm so absolutely proud of him! We can finally say farewell to the trusty blue strider which had been a crucial part of teaching all 4 of my children to balance and eventually ride a bicycle. It has served its purpose in my family and I will be passing it on to my brother's son. By the time my oldest kid outgrows this new big kid bike, he would be tall enough to ride an adult sized one. I can now look forward to cycling trips around the neighbourhood with all my children in tow!